Wise words from a very wise man! 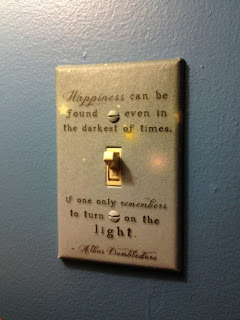 I love Dumbledore and I love Harry Potter, I mean really, who doesn't? I am seriously considering having the below in my future house. What is your blogspiration? If you are participating in the meme please leave me the link to your post! YES! I LOVE that quote!! 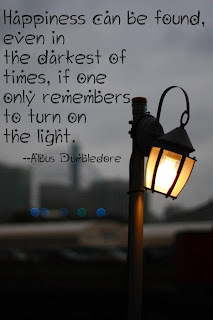 Oh, Dumbledore...he was so wise. And I am SO with you on the Pinterest obsession. Once I start pinning, I can't stop! Apologize? You obviously don't underhand the extent of how very very very much I adore Harry Potter, and if I owe Pinterest for that? Pinterest=win. Mwaha, OK, seriously, you've convinced me about Pinterest. That's fantastic! I love Dumbledore and to put that quote on a light fixture is even more clever. Thanks for sharing! OMG, I totally want that lightswitch cover, it's a great quote. Yaaay, Dimbledore is awesome. I L.O.V.E. love Harry Potter! And, I too, am addicted to Pinterest. If I'm not reading, watching a movie, or writing, I'm Pinning! Thanks for sharing!